I had the privilege of travelling to the beautiful city of Seattle to attend first the AIPLA Spring Meeting and then the INTA Annual Meeting. These conferences provided the opportunity to catch up with some old friends and meet some new ones, to learn and exchange ideas and information about intellectual property and to do a little bit of sight-seeing as well! 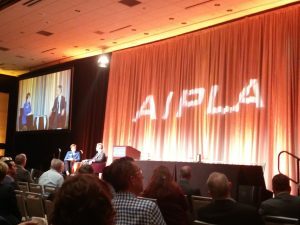 At the AIPLA conference, the new USPTO Director Andrei Iancu was interviewed by Lisa Jorgenson, Executive Director at AIPLA. Director Iancu discussed subject matters such as patent eligibility and examination quality. The technical sessions at the AIPLA were of very high quality and of good practical value. After the AIPLA conference it was time for INTA. This attracted around 11,000 delegates, with many more attending without tickets, so had a very different feel. 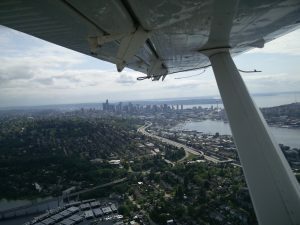 My highlight was probably the seaplane tour hosted by Delegate – you can see here the view of the city in the distance from the seaplane. The main highlight though was to network with my fellow IP professionals from around the globe. At Scintilla we work with ambitious companies who share our global perspective, so we deal with international patents and trade marks a lot, working with our colleagues in different jurisdictions. So a conference like INTA gives us a unique opportunity to catch up with our international colleagues in person, and to make new connections. Of course, one of the main topics that comes up in conversation is Brexit, and its effect on IP. There are of course many uncertainties but for patents it is “business as usual” – the existing patent system is basically entirely unaffected. Even if the UK ends up being outside of the future Unitary Patent and Unified Patent Court system, we will still be operating as European Patent Attorneys and can secure European patent rights in the EU and beyond. For trade marks, Brexit has more of an impact but there is political will on both sides to ensure continuity for rights holders and for UK-based representatives. We have written a Brief Guide to the effect of Brexit on IP – it’s a great resource if you are an attorney from outside the EU and you need to explain the issues to your clients. If you would like a copy, just message me, or subscribe to our newsletter, Scintilla Insights. It is an investment to attend these conferences, but one that I think is vital as we look ahead to continuing growth of Scintilla. The quality of our relationships with our international colleagues is something we take very seriously when we send work on behalf of our clients, and it is of course also good to raise our own profile to make sure our international colleagues know about our expertise with European Patents and Trade Marks. If you would like to discuss how we can support your own global IP ambitions, or how we can help with securing rights in Europe for you or your clients, do feel free to get in touch with me, and do let me know if you are going to be at subsequent AIPLA or INTA events!